THIS PAGE IS UNDER CONSTRUCTION TODAY WHILE WE ADD EXCITING WORKSHOPS AND RESCHEDULE OTHERS DUE TO EXCITING NEW EXTERNAL EVENTS THAT WE’LL BE OFFERING SOON!! 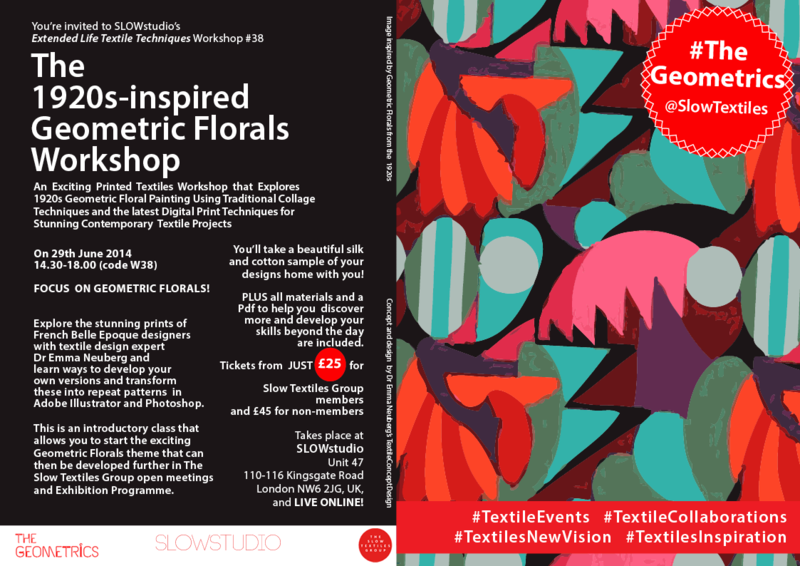 This exciting event takes place in the SLOWstudio where seven London textiles designers work daily to create exquisite textiles – knit, stitch and print – for retailers, galleries and private clients. 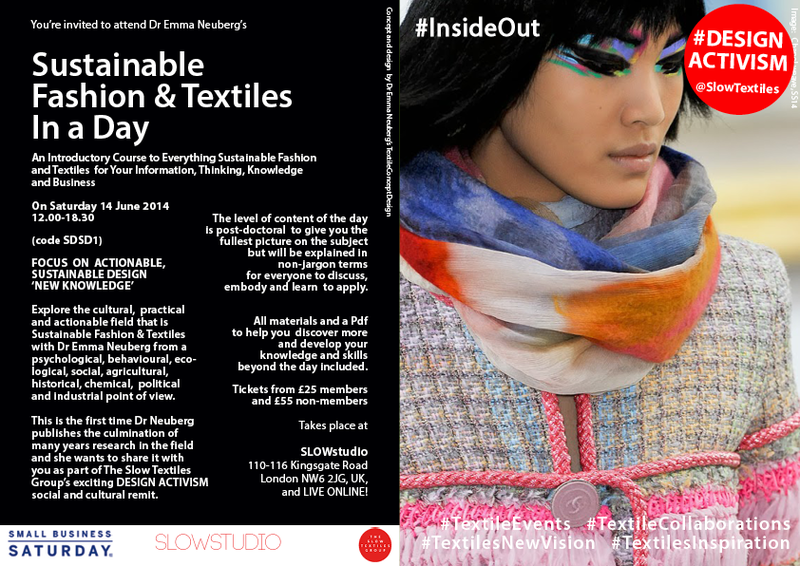 As we’ll be supporting UK Fashion Revolution Day (24th April 2014) and all the exciting events taking place nationally and internationally around this important focal point, Sustainable Fashion & Textiles In a Day attendees are invited to wear one item #InsideOut ! 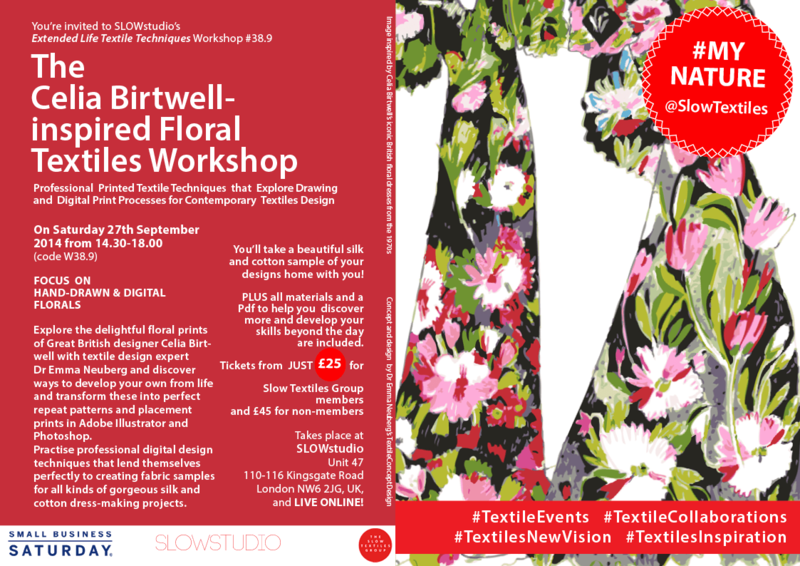 Online Attendance Tickets are available for your convenience from just £25 (Slow Textiles Group Members’ Price). We use Google+ Hangout which is easy to use (all you need is a Google+ account). 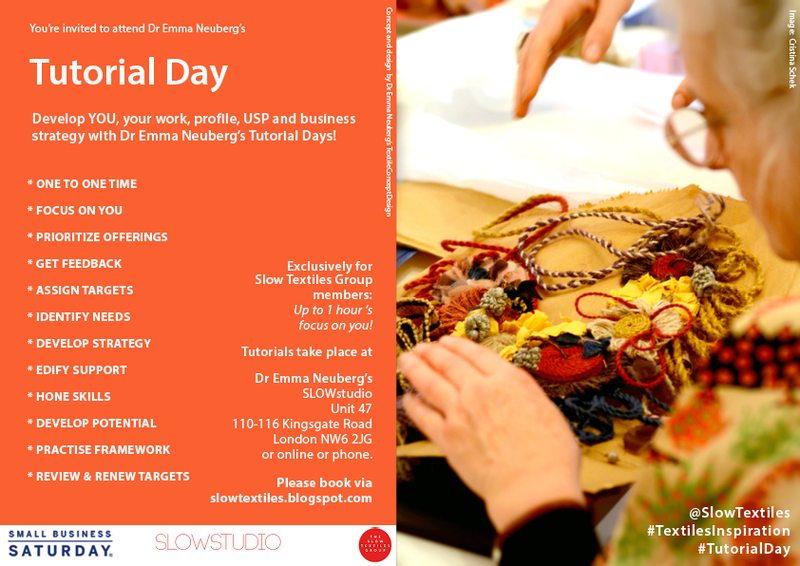 Alternatively, come to the London studio to gain the full experience of a professional textiles studio, personal tutoring, group experience and learning, Slow Textiles handouts and realia, new work made with our materials, embodied knowledge, networking, refreshments, a glass of wine and lots of fun from just £45! 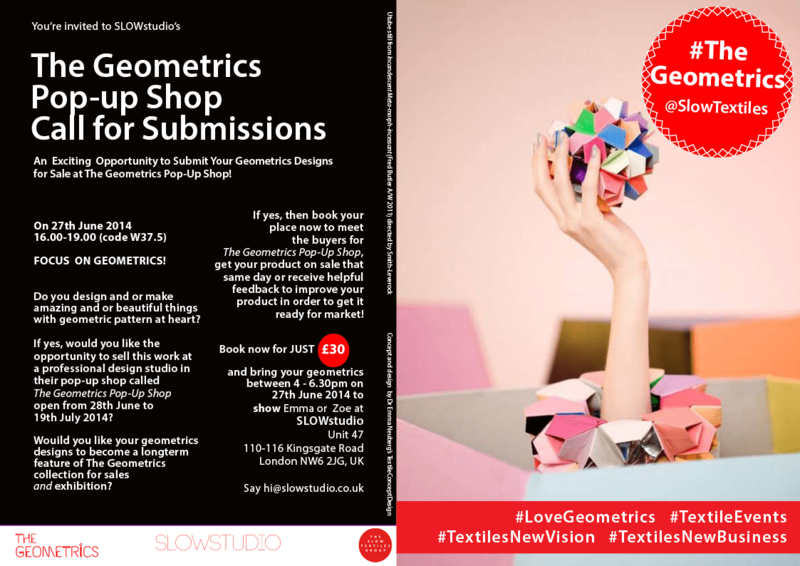 ONE-TO-ONE TUTORIALS FOR SLOW TEXTILES GROUP MEMBERS ONLY. Registration booking link coming soon! Non-members booking link coming soon. 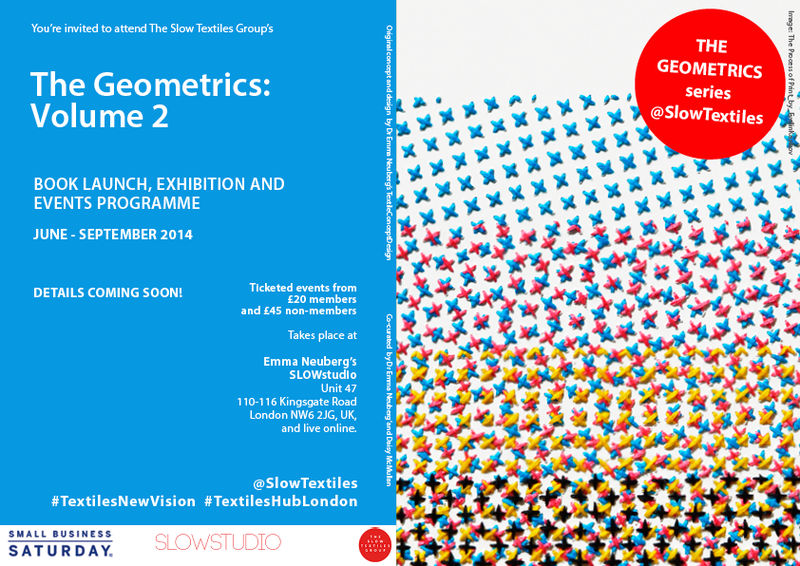 Online Attendance Tickets are available for your convenience from just £25 (Slow Textiles Group Members’ price). We use Google+ Hangout which is easy to use (all you need is a Google+ account). Alternatively, come to the London studio to gain the full experience of an exciting professional textile design studio, personal tutoring, group experience and learning, Slow Textiles handouts and realia, new work made with professional materials, embodied knowledge, networking, a glass of wine, refreshments and lots of fun from just £45 (Slow Textiles Group Members’ price)! If you like the look of our workshops maybe you’d like to become involved and become a member of The Slow Textiles Group where your work becomes a constituent part of Slow Textiles represented by Director Dr Emma Neuberg on her public programme of talks, publishing and curatorial projects. Next articleUncategorizedThe Geometrics Are Coming!